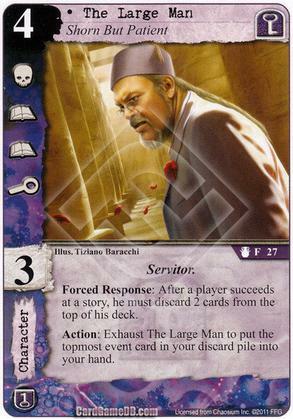 The built-in synergy between The Large Man's two abilities is what I love about this card. So many times you'll pack some milling and then feel a need to pack some recursion, or vice versa. With TLM, it all comes together in one nice tidy card. Sure, the lack of protection makes him an easy target, but you'll probably be able to retrieve at least one event card from your discard pile before he dies, meaning you'll do no worse than break even. The Investigation icon just feels like a bonus to me. The lack of protection keeps TLM from being a 5/5, but the synergistic abilities and the Investigation icon make him a rock-solid 4 for me.